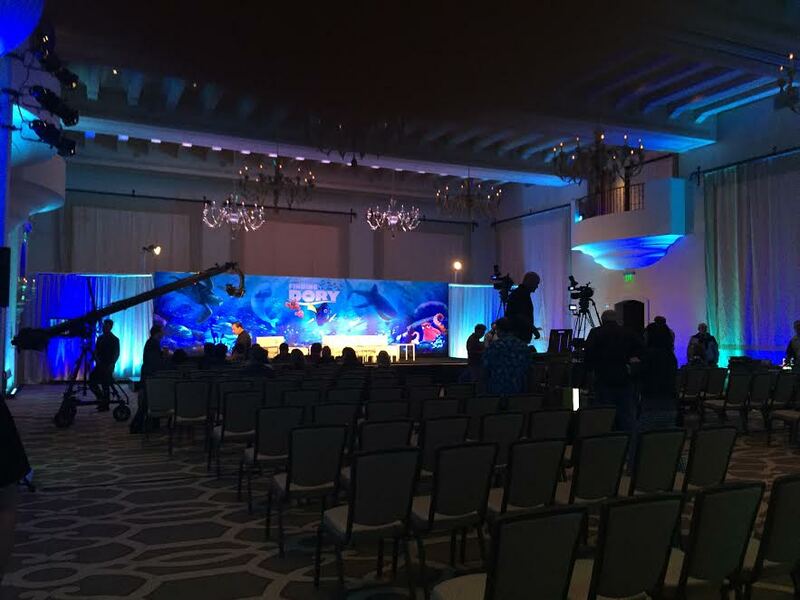 Last week Upcoming Pixar was invited to a Finding Dory press junket in Beverly Hills. There we got to see the fantastic cast of the film discuss their experiences while working on the project. The room was buzzing with excitement as the cast walked on stage. After watching a screening the night before at the Walt Disney Studios, we were excited to have a few hours set aside to hear about the making of the film and find out more about the new worlds depicted. It was certainly thrilling to get an opportunity to be in the same room as some of the talented folks apart of this film, ask them questions, and hear first hand about their time channelling their characters. The cast in attendance consisted of Albert Brooks, Hayden Rolence, Eugene Levy, Kaitlin Olson, Ty Burrell, Ed O’Neill, and of course, Ellen DeGeneres. Every cast member on stage contributed something wonderful and added to the story of Dory trying to find her parents. The junket was structured in a way where the audience members were able to ask questions to anyone on stage, which opened up some insightful inquiries. The cast was also very playful during the questions and were quick to bounce back for any comedic opportunities. When asked how the cast prepared for their roles, Ty Burrell mentioned how he had created a distinct voice that he thought would match the character perfectly. He wanted to channel the character like “a whale with a cold” since Bailey looked rather congested. After pitching the idea and voicing a few lines, Andrew Stanton politely insisted on Burrell doing “the whole film in his voice” rather than the fun little voice he had created. Albert Brooks pitched in that he kept his co-star Hayden Rolence, who voiced Nemo, “in a small tank for six months” as inspiration. In a previous conference that same day, director Andrew Stanton and producer Lindsey Collins shared some fabulous insight on how they were able to successfully revisit the world of Finding Nemo and also some of the obstacles they faced in production. Andrew Stanton’s song choices (Beyond The Sea and Unforgettable) in both Finding Nemo and Finding Dory were thematic. It was Robbie Williams singing a version of Beyond The Sea that inspired him to go the route of choosing a classic song but with a twist for the end of his films. Andrew’s new favorite character is Hank because he’s spent the most time with him, in terms of working with O’Neill during the records and dealing with all the technicalities with the character in production. Lindsay Collins loves Bailey and Destiny. It’s always inspiring listening to the filmmakers and cast talk firsthand about how they were able to collaborate and create such a fantastic film. Many thanks to the cast and crew for their time during the junket, and Disney/Pixar for letting us have the opportunity to be there. It’s highly recommended that you check out Finding Dory, which is finally released in cinemas today. We hope you’re as excited as we were to check out the film. And always remember… just keep swimming! Piper is a short film directed by Alan Barillaro and plays before Finding Dory. It’s definitely one of the more simplistic shorts from the studio as it depicts the struggles of a sandpiper hatchling trying to catch food without the help of its mother. As the bird finds out, it’s not as easy as it looks. It’s a sweet little film about learning how to be independent, acknowledging the environment around you, and facing your fears; no matter how silly they may be. One of the most charming aspects about this film is the amount of detail that was put into it and the fact that it’s told without dialogue. Piper is the cutest little bird, and even her ruffled feathers have character. I loved hearing during the press junket last week about the research trips that director Alan Barillaro and crew would go on in order to capture sandpipers in their natural habitat. The team would get down and dirty in the sand, waiting for hours for the birds to appear, and even submerging go-pros in the water to get the look they wanted for their desired shots. This film has so much energy and that’s in part to the overall cinematography and direction. Piper is full of macro-photography and photo-realism, as we get up close and personal with the hatchling in her environment. The music is also short, simple, and keeps the story moving with its fast tempo. The score was composed by famed guitarist and vocalist Adrian Belew. Check out the little teaser below to get a sense of what to expect come Friday when Finding Dory is released. It’s certainly been a while since we were immersed in the gorgeously depicted deep blue sea, traveling across the ocean with Marlin and Dory while being cradled with Thomas Newman’s score throughout the arduous journey. As soon as the lights faded in the cinema, the Disney/Pixar logos took over the screen, I was instantly submerged with nostalgia as the ever-familiar score filled the room. Finding Nemo is one of the most important films in the studio’s history, it changed everything about the animation industry back in 2003. The film had a refreshingly original story while being paired with breathtaking visuals and technology; it was only a little glimpse of the wonder and excitement that Pixar would bring us with future films. Since then, audiences begged and pestered Pixar – interrogating the filmmakers if they’re going to throw a sequel in the production lineup anytime soon. Even Ellen DeGeneres jumped on the campaign, begging the studio to make a film solely based on her beloved Dory. Lo and behold, in 2013, it was Ellen herself who announced the sequel on her talk show. We all waited, rather impatiently, these last three years for the film to wrap up production. It’s safe to say that Pixar is back at it again, in their 17th feature film, with Finding Dory. Although it’s not as perfect as the first film, with the clunky plot and pacing, the sequel still holds up as a separate film in the studio’s legacy. As we all know, Finding Dory is a story that focuses on Dory herself. At the start of the film we’re immediately introduced to a baby tang fish, with adorably large eyes. We soon find out it’s Dory and she’s been plagued with short term memory loss since she was a child. “But what if I forget you?” Dory asks her parents (voiced by Diane Keaton and Eugene Levy), who look on reassuringly, comforting their daughter that nothing like that will ever happen. Flash forward to Dory in the present day, a mere one year after it’s predecessor. Dory somehow got separated from her family as a child and has spent the last few years of her life looking, or in her case, continuously forgetting about them until running into Marlin; thus starting the events of the previous film. When Dory suddenly remembers her parents after a word triggers a memory (a constant occurrence in this film) it sets out her motivation to track them down and reunite with her family. Marlin (Albert Brooks) and Nemo (Hayden Rolence) agree to accompany Dory. Marlin is reluctant for Dory to set off on this pilgrimage, reminiscent of Marlin’s cautiousness with letting Nemo explore his curiosity in the first film. Dory relies on her newfound memories to track down her parents, which leads her to traveling across the ocean to California. The trio, in what feels like the blink of an eye, zip through the ocean on a current and reach the outskirts of Monterey Bay Aquarium. After Dory is split up from Marlin and Nemo, the two witness Dory being taken by researchers and carried away to the nearby aquarium. Inside, Dory meets a colorful cast of new characters ranging from Hank the octopus (Ed O’Neill), Destiny the whale shark (Kaitlin Olson), and Bailey the beluga whale (Ty Burrell). 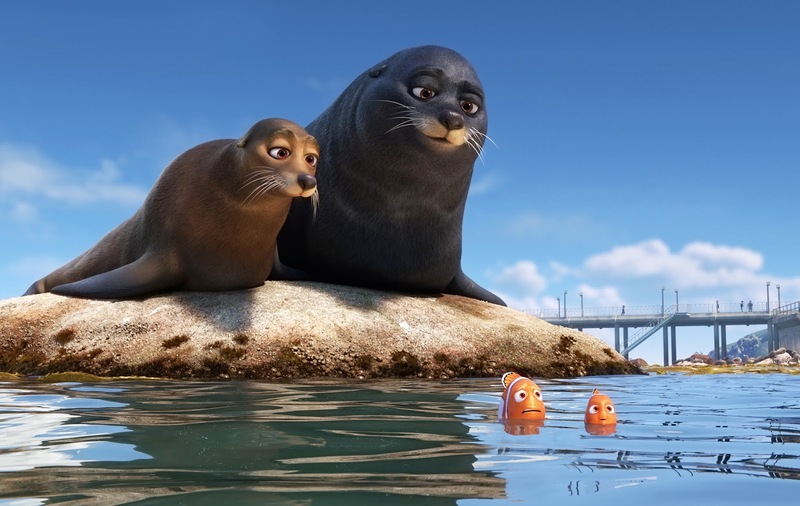 Nemo and Marlin also encounter a pair of lazy British sea lions (Idris Elba and Dominic West) as they try to figure out how they’re going to get into the aquarium to save Dory. Without giving away any of the key plot points or spoiling the ending, the remainder of the film follows Dory as she attempts to track down her family while adhering to the limitations of getting from one location to the other in the aquarium. Does Dory find her family? Are Nemo and Marlin able to reunite with her? What do the other characters offer in relation to Dory’s story of being reunited with her family? Pixar’s motto has always been, “The art challenges the technology, and the technology inspires the art.” With each new film released from the studio, it’s hard not to realize something spectacular with the designs in the film and the story itself. With Finding Dory, it’s like we’ve been blessed with a new HD TV and we’re re-watching our favorite movies on the device. The world still looks the same and is familiar, but it’s even more photo-realistic; the colors are brighter, the picture clearer, and the environments are more defined. There was a shot towards the middle of the film which showcased Nemo and Marlin floating towards the top of the ocean; the light from the sun on the surface was hitting the water just right and their reflections could be seen from the surface as the water moved back and forth. It was absolutely breathtaking. The setting in the film was a character all in its own; living and breathing and affecting the story. The aquarium itself is one of Dory’s main motivations and an exciting new setting to explore in the film. There are different areas that she has to travel to when she’s inside, and each object or phrase that triggers a memory for Dory helps her put together the fragments of her past to reach her family. Every new location within the aquarium has it’s own style, while also offering larger obstacles for Dory to get through to her goal. The best location was definitely the ever so friendly pet zone, where children were able to stick their hands rather viciously into the water feeling the different types of fish inside. It was nice to get a fair share of familiar faces from Mr. Ray and his knowledgeable tunes, to Crush the chillest turtle in the deep blue sea. We also got to meet some of our new favorite Pixar characters in Dory’s quest. It’s safe to say that Hank the octopus is now one of Pixar’s most stunning characters. He moves around so gracefully, even when lurking in the shadows. His character design is distinctive and lovable; Ed O’Neill’s work also makes it easy to fall in love with him. Hank is a key player in Dory’s story, she’s introduced to him almost instantly after finding herself deep in the aquarium. Hank agrees to help Dory find her family knowing that she is the key to him finally leaving the institution. Hank is a big curmudgeon at first, as these type of characters often are, but the more he spends time with Dory, the more his heart(s) turn into gold. In a recent press junket UP was invited to, Stanton himself mentioned that Hank couldn’t have been achieved had this film been made in 2003, or at least, he wouldn’t have been as effectively depicted as he was in the sequel. It’s true. Hank’s skin glistened, his tentacles moved effortlessly as he crawled across the stage, and it felt like at any moment he could burst through the screen. The modern technology has certainly helped Andrew Stanton and his crew tell a better story, and one no one could have told back it in 2003. Even having the majority of the action taking place in an aquarium offered some big challenges; the largest one being all of the new sets and massive crowd shots. Thomas Newman’s score also helps tie everything together. He most certainly works well with Andrew Stanton, as he successfully composed the last two of his films at Pixar. Newman captured some of the most tender moments of the film so perfectly; his score helping move the plot along and hitting us emotionally at the right moments. Newman’s music is filled with a sense of wonder and familiarity; the perfect theme tune for an adventure into the unknown. It was certainly great being back in familiar waters and reuniting with old friends, but the magic from the first film was lost somewhere in the transition. Throughout Finding Dory, there was really no sense of wonder. Sure, the technology is better than it was in 2003, the backgrounds were more realistic, the character models were upgraded, the allure from the first film was attempted several times; but it still somehow fell flat. Everything seemed incredibly easier this time around. It took Dory, Marlin, and Nemo mere seconds to cross the ocean and stumble on the supposed aquarium from her youth. Everything was too simple, the obstacles were almost repetitive, and certain elements in the story felt like they were added without motivation. The film certainly relied too heavily on the nostalgia of the first film, but even that didn’t work since Dory and Marlin’s chemistry somehow lacked this second time around. Dory was one of the most important elements of Finding Nemo, she was the sidekick, the supporting character who kept the plot moving forward; who offered something new to the story that affected the major players. Marlin and Nemo were the supporting characters in the sequel, and their struggles with each other as a family came across dull at times. Despite some of the obvious flaws in the story, Finding Dory does leave you feeling rewarded at the end. You get to watch Dory become stronger and a better person during her journey. You emphasize with Dory’s sense of belonging, her desire to find her family. You’re rooting for her all the way until the end. It’s an inspiring sequel that gives you the courage to fight on, no matter what type of obstacles get in the way; no matter who tells you what you can’t do; no matter what type of disability may set things off kilter; you just need to keep swimming. Dory helps us get through the day, and it’s hard not to ask yourself when times get tough, what would Dory do? Finding Dory hits theaters this Friday. Here’s Your Chance To Ask The Team Behind Finding Dory Questions! Upcoming Pixar will have the opportunity to interview the cast, directors, and producer of Finding Dory next week on June 9th. Do you have any questions for directors Andrew Stanton and Angus MacLane? What about any inquiries for the cast on your favorite fishy friends? Not only will you have the chance to ask them questions, but you’ll also be featured in a future post. Tweet us your questions or leave us a comment below about what you’d like us to ask them or know about their 17th feature film. Don’t forget to check out Finding Dory when it splashes into theaters June 17th! Behold! As the days get closer to the release of Finding Dory, we’re fortunate enough to continue getting little snippets of the film released by Pixar. Although this trailer is ultimately a teaser, there are some new settings we finally get to see in action. Before, there was only concept art to fuel our imaginations regarding the aquarium that Dory ends up in during her journey. We’re given two glimpses of the new environment: a dark, behind the scenes, and rather ominous scene of the aquarium with Hank and Dory (more than likely when they’re trying to escape); and the other a rather colorful and happy atmosphere showcasing Bailey and Destiny in front of guests. In this trailer we’re also reunited with Marlin, Nemo, and our old turtle friends from the first film. Finding Dory comes to U.S. theaters June 17th… and that glorious date will be here before you know it! How excited are you guys for the new film? Do you have any theories as to what Dory will encounter on her adventure to be re-united with her family? Let us know on Twitter or in the comments below. And remember, just keep swimming! The days are getting closer to the release of Pixar’s 17th feature film, Finding Dory. Recently the studio released some stunning concept art that sheds some more light on Dory’s story of searching for her long-lost family. The fun images showcase Dory exploring the vast ocean, a more detailed look at Hank the octopus, a school of stingrays, and both an aerial view and inside look of the aquarium. Even when all of the characters are in a shot, there is a huge sense of isolation when they’re paired against the backgrounds; it’s amazing realizing just how small they are compared to the world around them. There’s also a sense of mystery and adventure to the art. What exactly is happening around the characters that initially sparked the concept art? What is lurking behind the corners of the aquarium? There is so much energy and movement to the pieces that make them worthy of hanging in museum. What do you think of the concept art? Are you excited for Finding Dory? Let us know in the comments below! Lighting Exploration Concept Art by Visual Consultant Sharon Calahan ©2016 Disney•Pixar. All Rights Reserved. FINDING DORY – Pipe Nexus (Concept Art) by Artist Rona Liu. ©2016 Disney•Pixar. All Rights Reserved. FINDING DORY – Hank Design Concept Art by Production Designer Steve Pilcher. ©2016 Disney•Pixar. All Rights Reserved. FINDING DORY – Lighting Exploration Concept Art by Visual Consultant Sharon Calahan. ©2016 Disney•Pixar. All Rights Reserved. FINDING DORY – MLI Overview Painting (Concept Art) by Artist Tim Evatt. ©2016 Disney•Pixar. All Rights Reserved. 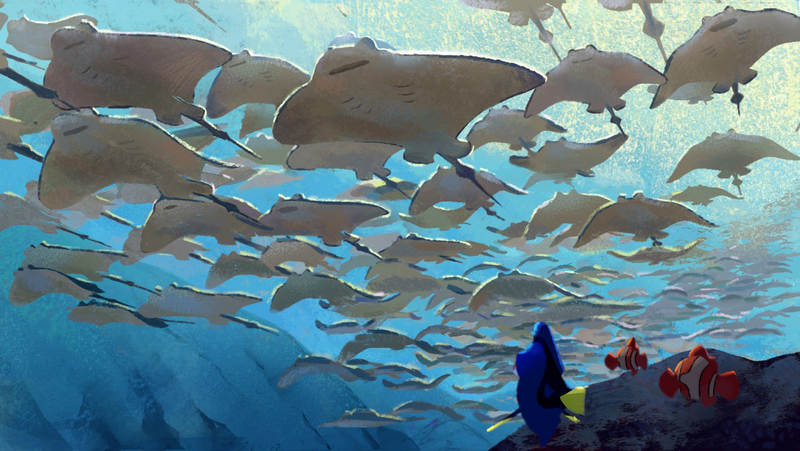 FINDING DORY – Ray Trench Painting (Concept Art) by Artist Rona Liu. ©2016 Disney•Pixar. All Rights Reserved. FINDING DORY – Hank Design (Concept Art) by Character Designer Jason Deamer. ©2016 Disney•Pixar. All Rights Reserved. Dive Right In To The First Full Length Finding Dory Trailer! We’ve got some fantastic familiar faces to greet us at the start of the trailer, like our good friend Mr. Ray, but we’re soon thrown into a new adventure. As we already know, Dory is on the search for her family. After Mr. Ray’s speech about instinct triggers old family memories for Dory, she soon becomes motivated to risk everything to find them again. In the trailer, we also spend some time in the aquarium that Dory stumbles upon in her quest. Dory is surprisingly re-united with a long lost Whale Shark pal named Destiny. Come to find out, Dory has hung out with Destiny on many occasions… it’s just that she can’t remember anything they’ve talked about. We’re also finally introduced to Hank the Octopus. Though skittish at first and hiding under sand in a fish tank, there’s a lot to love about him. I think Hank may already be my new favorite character from the sequel. It’s hard not to appreciate his camouflaged skit at the end and his near demise with the garbage disposal. The underwater world we’re revisiting is filled with even more life and color than in Finding Nemo. One can only imagine how stunning the reef and new locations will look on the big screen come June. It’s also important to wonder just what kind of new technology we’ll see utilized to create all of the backgrounds? I almost want to do a before and after side-by-side comparison to fully grasp the overall quality upgrade to the look of Finding Dory. I truly can’t wait to see Dory go through a journey of her own to find her family and what new things she’ll discover about herself along the way. Here’s to finally meeting her parents! On Friday Disney/Pixar released a fun little teaser trailer for their upcoming film Finding Dory. In the trailer we get to see Dory as her usual forgetful self as she jokingly reads the title of the film. The catchy tune by the Chi-lites, “Have You Seen Her,” plays on in the distance as she swims out of frame. The teaser is a precursor to the theatrical trailer that will be released on Wednesday, March 2nd on the Ellen DeGeneres show. Fittingly enough it was on Ellen herself who released the amazing news that Finding Dory was coming to theaters. Up until now we’ve only seen brief glimpses of Dory, Marlin, and Nemo (in addition to a few new faces), so it will be quite exciting to see some different footage on Wednesday. Be sure to check back in with us then when the trailer is released! Since joining the studio in 1997, MacLane has gradually risen through the ranks at Pixar. After making his directorial debut with BURN·E, he went on to direct the Toy Story short Small Fry and last year’s Toy Story of Terror. Going by Stanton’s tweet, Finding Dory will be his first feature-length film as co-director. MacLane seems to be a smart choice for the role, given his experience at the studio. MacLane has also made a name for himself outside of Pixar through his unique LEGO creations. You can see hundreds of his projects – including the one shared by Stanton – on his Flickr page. Finding Dory is scheduled for release on June 17, 2016.